NEW YORK — Baseball is filled with failure and can mentally destroy athletes who aren’t ready for the challenge. How do you eliminate fear, deal with uncertainty and make better decisions as you become mentally focused as a baseball player? The Sniper Mind by David Amerland reveals practical steps that allow a military sniper’s brain to work in a precise, calculated way as he meshes weapons knowledge, situational awareness, knowledge of ballistics and physics, emotional stability, empathy and acceptance of hardships. Three years in the making, this book explains advanced military training techniques of over 100 snipers he interviewed. He also delves into cutting-edge neuroscience which also references pertinent situations in the game of baseball. The book explains how these exceptionally trained snipers deal with weather that is typically too hot or too cold and cope with always tense situations with lives at stake, changing variables of targets moving, wind changes and distant targets as self doubt is dismissed. His account of British sniper Craig Harrison’s successful 1.5 mile shot was astounding because it was virtually impossible to hit a target at that distance when you factor in crosswinds or updrafts, glare, poor visibility, adrenaline pumping and people’s lives being at stake. Harrison didn’t let self doubt enter his thought process as he computed in his mind all the complex variables and hit his target. Amerland granted an interview with Collegiate Baseball and delves into many areas he covered in the book as he learned how snipers refine their mental skills typically over a 2-year period. Much of the information about sniper’s minds can be directly correlated to baseball. Collegiate Baseball firmly believes if baseball players learn the mental skills of snipers, a new generation of baseball player will be able to play the game at a higher level than ever. “As I was doing the research on this book, I could see there were a lot of analogies in terms of how peak performers actually work,” said Amerland. “The closest sport as far as how a sniper’s brain works is baseball where you have a single individual under tremendous pressure juggling all these variables in their own sense of vulnerabilities, fears and uncertainties. “For years, the commonly held belief was that all you need are talented players, and you refine their skills. But we have found that the mental game makes all the difference. The physical side can be worked on fairly easily. But the mental side is where you have to carefully construct so someone is resilient, resourceful, focused and calm in the middle of a storm. Amerland said the remarkable story of sniper Craig Harrison making his 1.5 mile kill shot is something baseball can learn from. “The primary obstacle we face whether it be a sniper or baseball player is ourselves. We can define the emotional or psychological aspect along with training and focus…all those types of things in order to perform well. “What is common between top performers in baseball in particular, but also in basketball and golf, is that snipers are somehow able to make themselves disappear for lack of a better explanation. “It’s like they absorb into what they are actually doing. It’s a state of flow and like the zen mind which loses sight of who you are as you are completely focused on what you are doing. “When we take this into baseball, if we can actually make the baseball player focus on what is important instead of the end result, suddenly their entire prospective is transformed. The magic of the brain is that the moment something changes mentally, it also changes physically because the brain ultimately runs the body. “In order to hit a baseball coming at 100 mph when the pressure is extremely high, you internally must make all those neural pathways connect in the correct order. To read more of this story, purchase the March 23, 2018 edition of Collegiate Baseball or subscribe by CLICKING HERE. 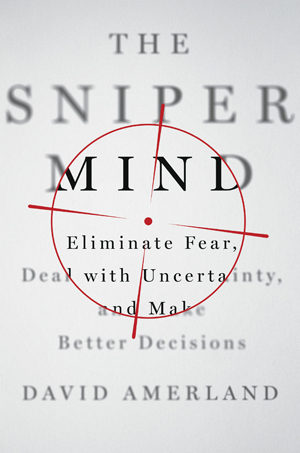 The rest of the story explains how snipers overcome fear and why the sniper’s brain doesn’t shut down in high pressure situations as many baseball player brains do. He also discusses stress and hormones, what relaxation is, the Holy Grain of brain analytics, the four branches of emotional intelligence and the value of meditation.